The hunt for the perfect shot of the season is over when you choose to scout your deer, turkey, predators, and other game with the Moultrie A-25i 12MP Low Glow Infrared Game Camera. With all the bare essentials and none of the bells and whistles you don't need, the A-25i is a perfect starting camera for those new to scouting. This low glow infrared 12-megapixel trail cam features a 60-foot detection range, lightning-fast 0.7-second trigger speed, and infrared flash so you catch all your wildlife action. Simply power with 8 AA batteries and set it up with the intuitive controls and display, even in low light conditions. Get ready for the hunting season by doing some serious recon with this infrared camera from Moultrie. This package also includes a 16 GB memory card from SanDisk. 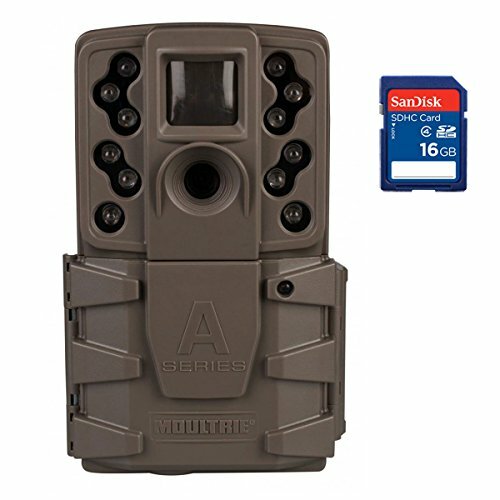 The memory card easily slides into your game camera and can be transferred to any SD compatible devices. For your peace of mind, it features a write-protect program that prevents accidental deletion of your media. This SD card holds up to 6,160 photos on a 10 MP camera or 240 minutes of video when recording at 9 mbps.